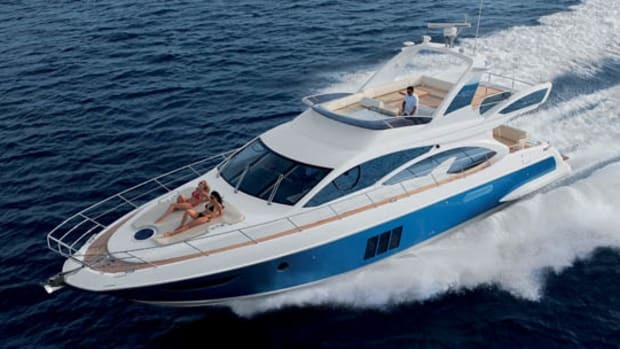 Power & Motoryacht's Boat Test of the Azimut 80. The Azimut 80 carries on the company’s legacy of building high-quality luxury yachts, but to the trained eye of European Editor Alan Harper, she does even more than that. It says something about a shipyard’s confidence when the crew makes a detour to the fuel berth before doing speed trials. Topping off afterwards, I could understand—but before? 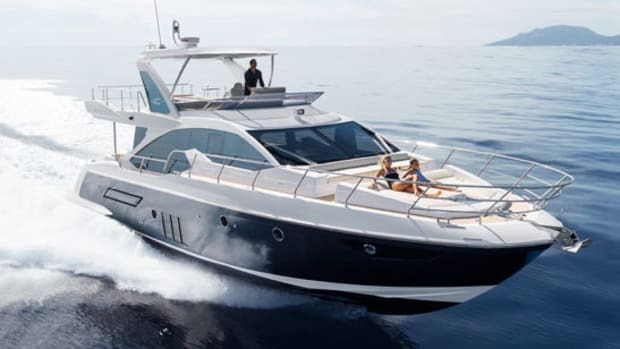 Although we already had plenty of diesel onboard the Azimut 80, we sat alongside in Savona for half an hour loading up the tanks with another few hundred gallons, bringing our total fuel onboard to about four tons. The water tank was full, too—another ton. Then we went out to sea and immediately bettered the advertised maximum speed for the yacht by more than a knot. It shouldn’t have been a surprise. 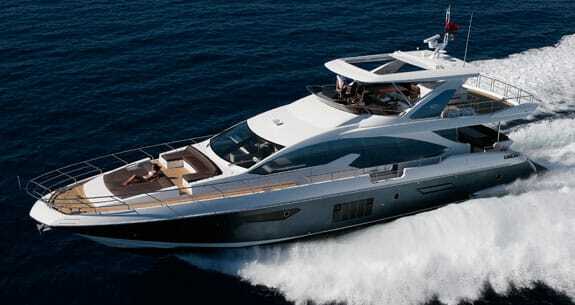 Azimut has been building boats like this for a long time—the company knows what it’s doing. 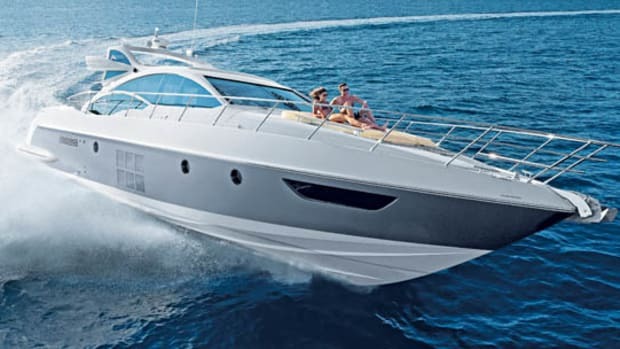 When I flew out to Viareggio for the Azimut 78 Ultra test in 1994, it might have been the biggest boat I had ever trialed, but even then it wasn’t the biggest boat in the Azimut brochure. These are the people, remember, who went to the 1982 Miami boat show with a 105-footer. And it wasn’t just in the matter of top speed that the 80’s performance exceeded our expectations. 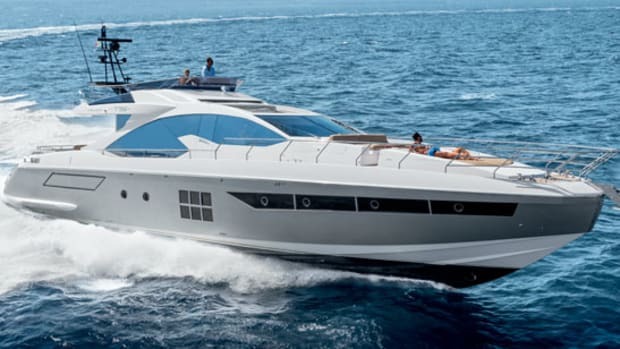 This first example of Azimut’s latest model was fitted with the optional 1,800-horsepower MANs, and the seemingly limitless supply of torque that bellows from these engines lent our 60-ton motoryacht the kind of urge and agility you might normally expect from something half the size. Handling was fun and responsive—although the fin stabilizers (you can have Seakeeper gyros if you prefer) ironed out much tendency to heel. With the motors’ impressive bottom-end grunt we could plane quite comfortably even at 1600 rpm and 16 knots, giving a 10-knot speed envelope for fast cruising—just the kind of versatility you appreciate when the wind picks up and the sea gets choppy. 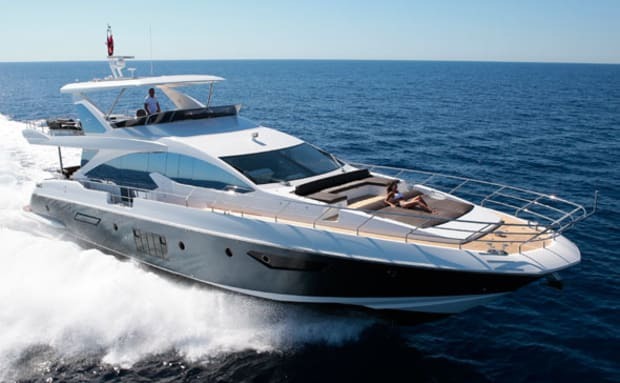 But although you might easily take it as fact that such an experienced shipyard as Azimut would get the naval architecture and engineering right, the shipyard also seems to know what it’s doing when it comes to the all-important business of getting noticed. The 80-foot sector is a surprisingly crowded market. To stand out you have to produce something that looks pretty special—so on our rather gloomy test day the shiny blue topsides and mirror-blue windows on the new 80 more than made up for the lack of summer sunshine. The yacht positively glowed. Design, naval architecture, and engineering are all crucial to successful yacht building. But you also need to get the economics right. Buyers at this end of the market don’t like being told “no” too often, but many a shipyard has hit the skids after giving in once too often to a customer’s demands. 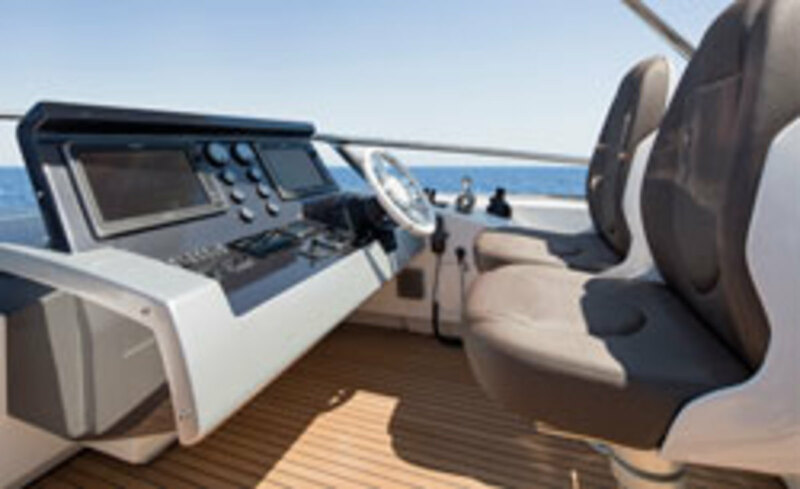 So customization options on the Azimut 80 have been carefully calculated to provide as much client satisfaction as possible, without blowing a hole in the bottom line. For example, there is a choice of an enclosed or an open galley. That’s a change which makes a massive difference to the look and feel of the entire main deck, but which for the shipyard is simply a matter of fitting, or not fitting, bulkheads since the galley’s position and layout don’t change. In another simple but significant option, the chest of drawers in the master suite can be exchanged for a sofa. Then there is the décor—four schemes, designed by Achille Salvagni, which allow customers to choose different combinations of furnishings, finishes, and fabrics, and which also come with alternative specifications of door furniture, bathroom fittings and lighting fixtures, to ensure that every 80 gives its owner that reassuring sense of individuality. Inside, too, the shipyard’s experience shows. Interior decoration is a personal business, and trying anything too dramatic is risky. A modern yacht’s accommodation must be smart, comfortable, and well executed, but above all it must be easy to live with. The 80’s design, by Achille Salvagni, has a restful way with tones and textures—and if the interior scheme shown here is maybe a little too restful for you, there are three others to choose from (see “Better Boat: Something For Everyone,” right). With her vast flying bridge and equally expansive interior spaces, the 80 shows that Azimut also understands how space is the ultimate luxury on any boat. Floor-to-ceiling windows accentuate the size of the saloon, while down below a massive master suite, with a full-beam head, provides some 280 square feet of plush accommodation. Two further double cabins, in the bow and on the port side, compete for the title of VIP suite, and a fold-down Pullman berth in the twin cabin on the starboard side brings the yacht’s sleeping complement to nine. The beds are all full-size. Nowhere in the main- or lower-deck guest areas does headroom fall below 6 feet 5 inches. And a dayhead is fitted as standard, as if this remarkably roomy vessel really were a superyacht. Finally, an experienced shipyard understands the importance of practical details. 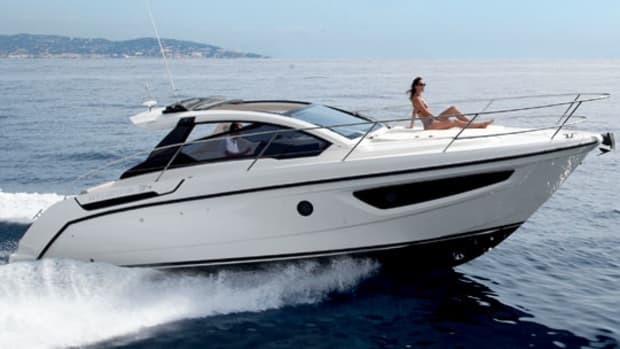 The boat that can truly boast enough stowage space has not yet been built, but the 80 comes pretty close, with useful volumes available beneath all the double berths, which lift up completely on gas struts, as well as under the lower companionway. There is a dedicated compartment off the lower lobby for a washing machine and dryer. Bulwark doors make getting on and off when moored alongside safe and easy. Up forward, teak grates cover the windlass and anchor chain to make the foredeck as guest-friendly as the cockpit. The hardtop is an option, but the electric bimini over the foredeck seating is standard—as is the one-ton capacity hydraulic aft platform, which can take a tender of up to 12 feet 7 inches. The aft section of the upper deck, meanwhile, can be fitted with two large L-shaped sofas and a couple of coffee tables, or with a 1,100-pound davit on the port side to handle a second tender. 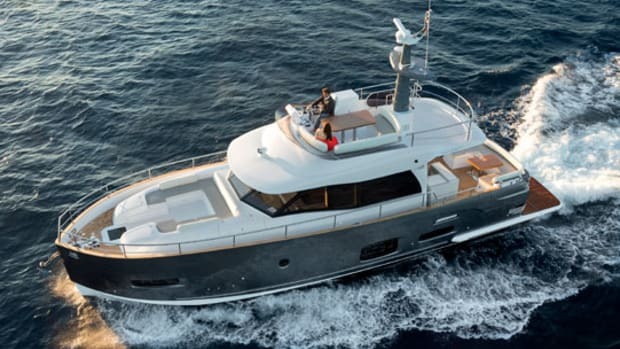 Cruising comfortably in Azimut’s home waters between Savona and Varazze, the most notable thing about this impressive new yacht was how finished she felt. Everything worked. Nothing needed explaining away. No modifications were being hastily sketched in the drawing office. But any 80-foot motoryacht is a hugely complex piece of machinery, and you’d expect a prototype to have at least a few issues, right? Not this one, apparently—the only things I could think of changing were minor details, or matters of personal taste. 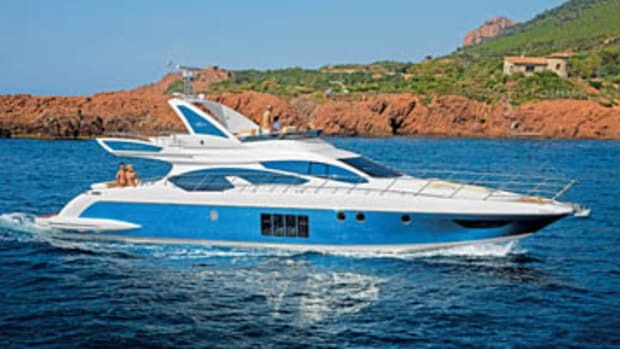 And this was not just the first 80 to roll off the line at Azimut’s factory in Fano, but also the first yacht of this size to be designed at the company’s Avigliana design office, rather than in Viareggio. Yet none of this seemed to matter. 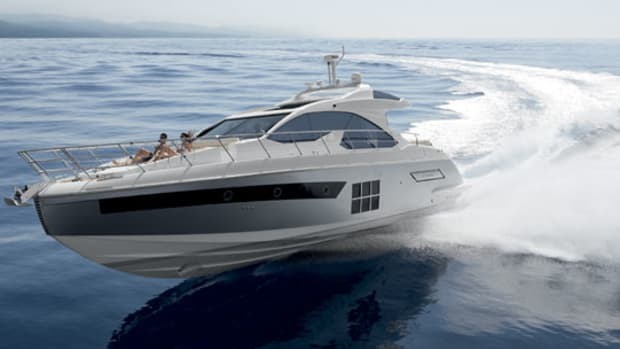 Azimut clearly knows what it’s doing, and the new 80 was certainly ready to go. Noteworthy Options: Engine upgrade to 2/1,800-hp MAN CR V12 diesels ($140,000); CMC fin stabilizers ($190,890); 28-kW generators ($16,030); adjustable table on flying bridge ($2,940). 1,250 gal. fuel, 290 gal. water, 4 persons, 250 lb. gear.